frequently recommended by medical professionals such as chiropractors, physiotherapists and osteopaths. Last but certainly not least, it’s important to note that LiftFoam mattresses are one of the most highly durable mattress types available. If you are going to be purchasing a mattress, it makes financial sense to purchase a very long-lasting one.Knit fabrics are different from woven fabrics in that the strands of yarn are looped together as opposed to being straight. Knitted fabrics can stretch in any direction because the stitches are in loops and can bend in any direction without stressing the knitted fabric, offering much more “give” and elasticity over woven fabrics. Knit fabrics are different from woven fabrics in that the strands of yarn are looped together as opposed to being straight. Knitted fabrics can stretch in any direction because the stitches are in loops and can bend in any direction without stressing the knitted fabric, offering much more “give” and elasticity over woven fabrics. Elasticity in a latex mattress cover is crucial because allows the fabric a natural way to be wrinkle resistant and stretchable without becoming permanently distorted, which in turn allows the layers of latex underneath to give optimal pressure relief. This is important as reduction of pressure on the surface of the mattress reduces the constriction of blood flow to the neurological system, providing a deeper undisturbed sleep, thus optimizing regeneration and restoration that comes naturally from sleep itself. Elasticity in a latex mattress cover is crucial because allows the fabric a natural way to be wrinkle resistant and stretchable without becoming permanently distorted, which in turn allows the layers of latex underneath to give optimal pressure relief. This is important as reduction of pressure on the surface of the mattress reduces the constriction of blood flow to the neurological system, providing a deeper undisturbed sleep, thus optimizing regeneration and restoration that comes naturally from sleep itself. Heavy Duty Posturized Platform – with additional support in the center third, where you need it the most. Rigid support for stable performance 9″ heigh. Heavy Duty Posturized Platform – with additional support in the center third, where you need it the most. Rigid support for stable performance 5″ height. LiftFoam® delivers a unique balance of soft comfort with proper support for your spine. An additional benefit of a LiftFoam® mattress is that it does not transmit movement easily, meaning that if you sleep with a partner, you won’t feel their movements on your side of the bed. Superb body pressure distribution properties also means that LiftFoam® mattresses are frequently recommended by medical professionals such as chiropractors, physiotherapists and osteopaths. Last but certainly not least, it’s important to note that LiftFoam mattresses are one of the most highly durable mattress types available. If you are going to be purchasing a mattress, it makes financial sense to purchase a very long-lasting one. Knit fabrics are different from woven fabrics in that the strands of yarn are looped together as opposed to being straight. Knitted fabrics can stretch in any direction because the stitches are in loops and can bend in any direction without stressing the knitted fabric, offering much more “give” and elasticity over woven fabrics. Knit fabrics are different from woven fabrics in that the strands of yarn are looped together as opposed to being straight. Knitted fabrics can stretch in any direction because the stitches are in loops and can bend in any direction without stressing the knitted fabric, offering much more “give” and elasticity over woven fabrics. Elasticity in a latex mattress cover is crucial because allows the fabric a natural way to be wrinkle resistant and stretchable without becoming permanently distorted, which in turn allows the layers of latex underneath to give optimal pressure relief. This is important as reduction of pressure on the surface of the mattress reduces the constriction of blood flow to the neurological system, providing a deeper undisturbed sleep, thus optimizing regeneration and restoration that comes naturally from sleep itself. Elasticity in a latex mattress cover is crucial because allows the fabric a natural way to be wrinkle resistant and stretchable without becoming permanently distorted, which in turn allows the layers of latex underneath to give optimal pressure relief. 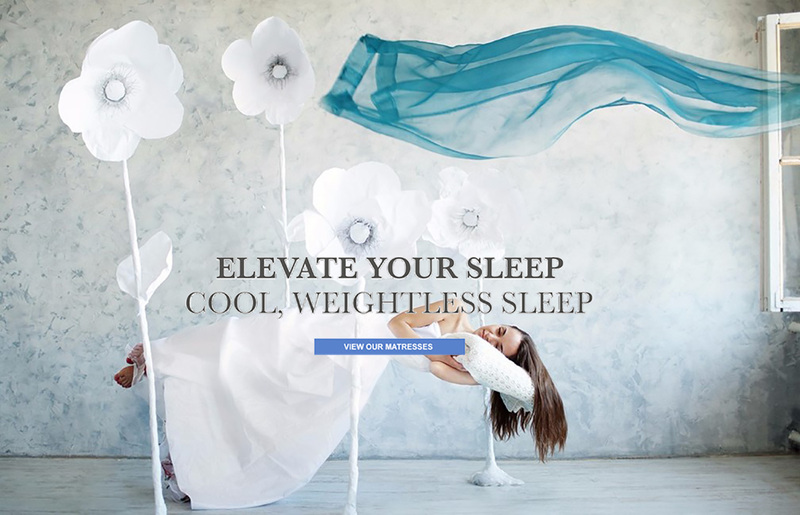 This is important as reduction of pressure on the surface of the mattress reduces the constriction of blood flow to the neurological system, providing a deeper undisturbed sleep, thus optimizing regeneration and restoration that comes naturally from sleep itself.